Celebrate with a salad… said no bear ever! While National Pride Month in June will see more of us hitting the streets, May’s National Salad Month is still worth a little celebrating. As spring days warm toward summer our palates crave lighter, fresher, brighter tasting foods and admit it, you kind of love a good salad whether it’s a blue cheese and bacon-topped wedge or one piled high within a fried taco shell. Salads, from a bowl of greens to a hearty Niçoise can be a simple side or a one-dish supper. Speaking of salads… This past week, a local farm market manager asked if I could cook catfish at my demo. Live. In front of an audience. Now, while I cook a fair amount of fish, I was terrified. Fish is a more delicate protein than chicken or beef and since I get easily distracted while talking to audiences I had images of producing tough, dry, overcooked fish. In front of an audience. But I forged ahead with developing a recipe. The fish I was asked to cook was Blue Catfish. It was introduced into the Mid-Atlantic’s Chesapeake Bay in the 1970’s and has become invasive. To control the population, groups like the Wide Net Project are encouraging more fishing – and eating – of Blue Catfish. 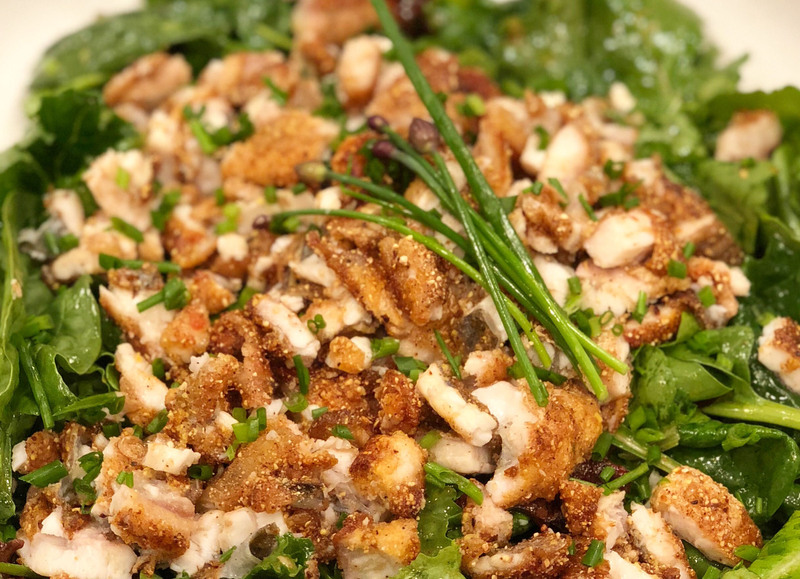 So I crusted the fish with cornmeal and fried it up before cutting it into crouton-sized pieces, serving it over greens tossed in an Old Bay vinaigrette – after all, we are in Mid-Atlantic crab country. The results in my test kitchen and at the farm market were a delicious success. So here’s the recipe for Crispy Cornmeal-crusted Catfish Crouton salad with Old Bay Vinaigrette. Say that five times fast. Happy National Salad Month and let me know below what your favorite salad is. Chef’s note: Fish can buckle and curl over heat so press down on it with your spatula for few seconds. In a shallow bowl combine cornmeal and paprika. Season to taste with salt, pepper and cayenne. Pat fish dry with paper towels and dredge in cornmeal mixture. Warm 2 tbs vegetable oil in a 12” skillet over med-high heat. Add 1/2 of the fish and press down with a spatula until it releases easily. Flip fish and cook through until it flakes easily. Repeat with remaining fish, adding additional vegetable oil if needed. Make dressing: mash garlic into a paste with coarse salt. Place in a med bowl and whisk together with Old Bay, honey, and vinegar. Season with pepper. While whisking, drizzle oil into vinegar mixture to form a creamy emulsion. Season to taste with hot sauce. Lightly dress greens. Chop fish in 1/2” pieces and serve over greens. ← Let’s go back to Summer Camp!